Batti Gul Meter Chalu starring Shahid Kapoor, Shraddha Kapoor and Yami Gautam, is all set to release on 21st September. The shoot of the film was recently wrapped up in Mumbai with a song. Apart from Mumbai, the major parts of the film was shot in Tehri, Uttarakhand. The film directed by Shree Narayan Singh is a social drama based on the struggles of a common man against the power distribution companies over exorbitant electricity bills. 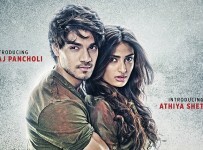 Batti Gul Meter Chalu is produced by Bhushan Kumar, Krishan Kumar, Shree Narayan Singh, Nitin Chandrachud, Kusum Arora and Nishant Pitti.